All kind of Transmission Parts. Gear Couplings, Spockets, Belts etc. 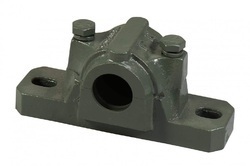 Bearing is mounted in Plummer Block, Plummer Block is used to provide support for a rotating shaft with the mounting surface on a parallel line with axis in the shaft. Sutable for High Quality heavy-duty applications. Depending on loads and installation, it is a multifunctional load carrier for drying, cooling or moving hot parts. 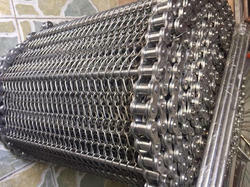 Wire mesh conveyor also ideal for heat-treated, washed, dried or quenched parts.. Numerous optional belt types are available. They are also ideal for a variety of light and heavy duty applications, including machine tool and chip-handling environments, die casting operation, stamping operations, whole plant chip and scrap removal systems, inspection, parts handling and package operation. 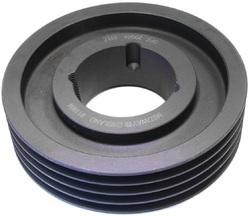 The taper bush pulleys are manufactured in state of art technology manufacturing plant on precision cnc machines. taper bush pulley eliminates re-boring and key way problems, since each pulley need not be finished according to different bore and key way requirements. With the help of taper bushes, changes in the diameter and position of pulleys are easily made. The taper bush pulleys are therefore ideally suited for wide range of application in the entire field of drive technology. all taper bush pulleys are made from superior quality cast iron in over 400 standard sizes . Tbp confirm to is and iso groove specifications and standard sizes can transmit up to 330 hp of power at 1440 rpm. dual duty grooves conforming to iso specifications to perfectly match classical 'v' and spacesaver wedge section belts. using taper bushes, it is possible for unskilled labor to achieve 'shrink fit' of pulleys on to shafts using a hexagon wrench only. The arrangement of half – threaded holes and longitudinally split tapered bushes ensure maximum grip and fast, easy fitting. Tightening of the screws into the threaded holes in the hub forces the bush in to the taper bored components, thereby effectively contracting the bore of the taper bush until the equivalent of a shrink fit obtained. Taper bushes are suitable for metric shafts and can also be supplied with imperial bores and keyways. 1. No re-boring and keyway costs. 2. Saves time and cost in fitting. 3. Eliminates precision taper fitting keys. 4. Interchangeable between many products. 5. Taper bored components can be transferred to other diameter shafts by fitting alternative bore bushes. 6. Convenience in dismantling for maintenance and component replacement. 7. Accommodated shaft limits of +0. 05mm and -0. 1mm. Our Packing Belt Conveyor is backed by latest technology support, Belts Conveyor for Food Packing offered provides for superior conveyor belting support and feature flat smooth surfaces. Available with different textured top choices for meeting the conveying needs of applications needing extra grip, here our expertise lies in making these available in different shore hardness choices as well as with customized fabrication support as demanded by the customers. Featuring one piece extrusion, these conveyors are developed using superior material support to provide suitability in food applications. Some of its benefits include offering easy cleaning support, smooth performance that lowers overall conveying costs, offering ease of welding endless, ensuring lower bacteria counts, meeting international hygiene standards for food contact materials and others. Packing Belt Conveyor manufactured by us are made available in different range options and are well recognized for delivering optimum performance. These are widely used in packing in various industries.